Welcome to Riverdale! Our newly, completely renovated 110 year old house, with its high ceilings and modern renovation is ready for you to enjoy. Our space is great for couples, business travelers, solo adventurers, and families. We are situated close to downtown, but in the warm, friendly community of Riverdale. A minute or two's walk down our tree lined street will get you to the subway, restaurants, shops, grocery store, the Danforth Music Hall and both Riverdale and Withrow parks! The Danforth is a vibrant, exciting neighbourhood to be in. We are situated between two parks - Withrow (check out the farmers market on Saturday morning, Dusk Dances, Shakespeare in the park, catch some ball hockey action or tobogganing in the winter) and Riverdale (the most beautiful views of the Toronto skyline, a bike path down to the waterfront, or up the Don river, and the best toboggan hill in the city). There is plenty of restaurants to suit any palate - from traditional greek food, a fabulous fish and chip shop, wine and cocktail specialties, to Mexican and tapas, pubs and family-style restaurants. There are incredible coffee stores to sit in and absorb the pulse of the neighbourhood (Si, just at the end of our street, the Rooster, just a few blocks down right across from Riverdale park, and my favourite hidden gem - MoGC for the true connoisseur- a longer walk, or short drive from us). 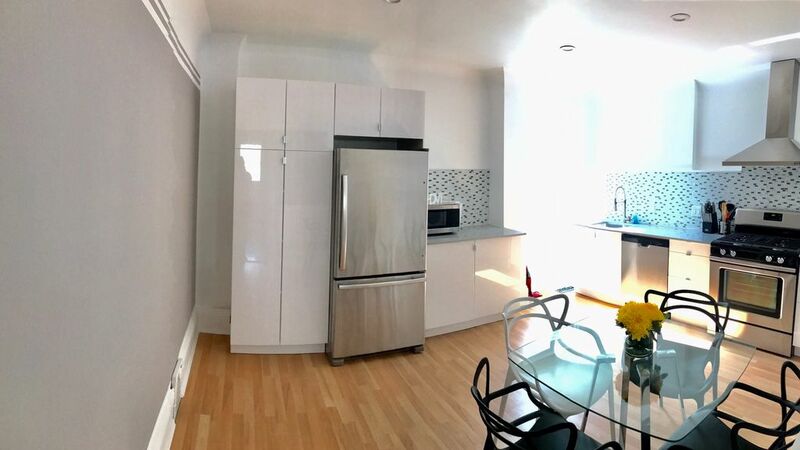 The space is a large, bright 2 bedroom, with one bathroom. It occupies the main and upper floors of a centennial semi-detached house with a modern renovation - including air conditioning. There is porch bench to sit on and enjoy our lovely neighbourhood. It is a simple but charming mix of old and new. There is a large cozy couch and an old fashioned comfortable chair with which to relax. A 32" inch television with Fibe cable, a magazines and books and few games to entertain you if you choose to spend a quiet night in. The kitchen has been completely upgraded. There are beautiful quartz countertops, and stainless steel appliances, including a gas stove, dishwasher, full size fridge including an ice maker in the freezer. We have two coffee makers for your morning cup - drip coffee (both regular and decaf) and a Nespresso machine if you prefer an espresso to really wake you up. A kettle and tea is also available. Pots, pans, bowls are provided for your cooking needs. There are settings for 4 plus a few extra, to set up the square kitchen table for meals. Upstairs there are two bedrooms - a larger master with a queen size bed, and a smaller back bedroom with a double. Both bedrooms have ample closet space (the back bedroom is cedar lined) and have above bed fans. The beds are comfortable with down blankets and a mixture of down and hollow-filled pillows to suit your needs. For your safety and peace of mind - under the fresh linens, the beds and pillows are completely wrapped in bed bug protectors. The full 4 piece bathroom is on the second floor - including a tub. Fluffy towels are provided, as are shampoo and soap. We are very accessible by all forms of transportation, and it is very easy to get to all your destinations. Subway: The Broadview subway station is a two minute walk. Street Car: There is a street car stop just off the end of the street, providing a lovely scenic ride to downtown. Cycling: We are only a few minutes ride down to some fabulous trails which lead all the way along the Don River, or to downtown. Hop onto a Bixi bike and experience Toronto in a completely different way! Driving: While we are easily accessible by car, just a few blocks from the highway, we don't have a driveway. Parking in our neighbourhood is by street permit, which we can help you obtain for the city's small fee. Most often, parking will be able to be found right in front of our house, but occasionally, it can be tricky and you may be a few houses down. We have lots of tips and tricks to help you out (we've lived here for 14 years!) We also have lots of familiarity with driving downtown and throughout the outskirts of Toronto, so are happy to help you with any information that you need. We live very close by, and such are available to you needed. Feel free to join us, if you would like, for a beverage and a chat. We are just a door knock or a text away! Note: For identification, you must have a clear and recent face picture in your profile to confirm your booking. Bookings without a face picture will not be accepted. We are a family of four - an arbourist, a teacher of the Deaf, and an up and coming figure skater and hockey player. We have a border collie named Dax, a cat named Cozmo and two budgies to round out our family. We have a broad spectrum of knowledge about Toronto and its surrounding area and are happy to help you enjoy our neighbourhood and get the most out of your trip to Toronto! With its new renovation and proximity to downtown, our house in vibrant Riverdale is the perfect place to stay. We have an wealth of knowledge of Toronto and are happy to share it with you - whether you are looking for more of a touristy experience, or something a little more niche and local. We can help you walk through it all. With our amazing restaurants, friendly people, with tree-lined streets and parks to stroll in, you will love Toronto even more! Our house is a perfect example of an upgraded century home in Toronto. We are in the most amazing neighbourhood - restaurants, shopping and everything you could possibly need. Added to that, we are just a short hop on the subway (a short block away), to downtown! The bathroom has a full size bathtub, shower, easy flush toilet and sink. There are lots of towels, shampoo and soap. A small caddy of things you may have forgotten is under the sink. There is no parking spot associated with the space. Parking is through a City of Toronto permit, which we are happy to assist you in getting. Please see the description of the house for details. A large comfy couch, and two chairs, a TV and side tables. There are blankets in the blanket box if you feel cool. Modern refrigerator with an ice machine! Gas cooktop stove with a full oven. A full size oven under a gas stove. The microwave will accomodate a full size plate. With coffee for your morning cup! We are slowly building our pantry items. We have a few oils, basic condiments and spices. Dishes and utensils for four. Bright eat in kitchen with a gas stove/oven, dishwasher, refrigerator, microwave and coffee maker. We can provide you with an extra chair or two if you need. A few books are in the house, and we are happy to provide more upon request. A few games are in the house, and we are happy to provide more upon request. Please let us know the age of the children coming and we are happy to provide some age appropriate toys! You are welcome to borrow our kayak on request. You are welcome to borrow our bikes and bike locks upon request. The tennis courts are a short distance away. We have a couple of rackets you can borrow on request. There are two pools at community centres a short walk away - one indoor and one outdoor. Really lovely house, with very helpful hosts. Property was very clean, nicely decorated, and worked well for our small family and dog. It's very close to a subway, a major grocery store, a dog park, and is in a great neighborhood for taking the dog for a walk. Pepper was very responsive and helpful when we forgot to print out our parking permits. I had a great time at Pepper's rental. Everything was well equipped and welcoming. Yoga around the corner and the whole Danforth 'hood at the doorstep. I'll be back. Pepper and her husband were very accommodating and made our stay pleasant and comfortable. Friendly, but not too friendly, they helped with a parking pass for the street and allowed us a later check out. The location can’t be beat. Steps from Broadview station. Close to all of Danforth. Beautiful, clean property in great location! I highly recommend it. Pepper & husband were great. Just a great place. Highly recommend. Super value. Nice owners. Only stayed one night, property was very clean, recently renovated, and in nice quiet neighborhood. Wished we could have stayed in Toronto longer. We are located steps away from the Danforth - a very vibrant area of Toronto. Only a short subway ride from downtown, we are a green oasis away from the bustle of the busy city. There is so much to do in this friendly neighbourhood - coffee shops (big chains like Tim Hortons and Starbucks, to local shops like the Rooster, Si and Broadview Expresso), shopping (Canadian designers and boutique stores), The Big Carrot naturopathic stores, too many restaurants to name, and beautiful parks to relax and enjoy. We are right in the heart of the famous Greektown street festival, Dusk Dances, Shakespeare in the park and so much more! There is always something going on, on the Danforth!